The Bureau of Land Management (BLM) manages over 2.6 million acres of public forests in western Oregon and has recently undertaken efforts to revise all of its forest plans. These plans aim to dramatically increase timber harvests by 60% and ressurect the archaic practices of clearcutting older forests. The draft of the proposed plan is currently undergoing a comment period where members of the public can weigh in on the proposed changes. The BLM is required to consider all comments submitted by the public. Cascadia Wildlands has worked up extensive comments on the proposed ramp-up as part of a broad conservation coalition effort, but it is also critical that the BLM hear from general members of the public on how these changes will affect them, or their opinions on what the BLM is doing with these lands that belong to each and every one of us. The comment period ends this Friday, August 21, 2015, and it is critical that the BLM hear from YOU. That you oppose more roads and clearcuts and that you value our public lands for the clean water, native species, and amazing recreation oppurtunities. Click here to personalize your comments that can be submitted by email. — Every voice counts. Thank you! Water and Salmon. While droughts in neighboring regions also draw attention to water conservation. The impact that clearcutting has on the incredible water-storage capacity of these old rainforests cannot be overstated. When you clearcut, you lose the “sponge effect.” In an environment with vegetative cover, the soil acts like a gigantic sponge, storing a vast quantity of water that is used by plants and trees or released gently into streams and rivers. Without this extensive nutrient exchange network and it’s crucial water storage capacity, the affects on salmon and human communities who rely on abundant clean water can be devastating. Water is the lifeblood of our region, and we will vigorously defend it. Livability. Oregon’s great outdoors play a major part in the reason why many of us live here. From the boundless streams and rivers to the tracts of roadless wilderness in the region, it is easy to understand why Oregon was named the top place in the country people moved to last year. Join us in the fight for the cornerstone of what makes our region so special. Climate Change. 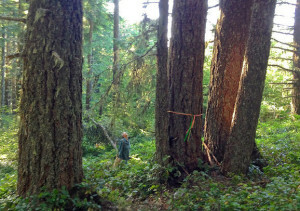 The old rainforest in western Oregon play a pivotal role in regulating our climate. The stately forests in our region store more carbon per acre than any other forested ecosystem in the world, and for that we must do all we can to ensure they remain standing so they can continue to absorb carbon dioxide from the atmosphere. We are facing this challenge with the fierce determination it calls for. Iconic Wildlife. From the secretive marbled murrelet and majestic northern spotted owl to the elusive Pacific fisher, these older-forest-dependent species need increased protections for their survival. Wildlife needs a voice, and we will continue our role as a champion for wildlife. After submitting your comments, please consider making a donation to help support this critical work.